A more subdued Russell on BBC Question Time tonight. I’d play a game of ‘Let’s see who can stay quiet, the longest’. Russell, sweetheart, it’s time to stop talking. One must know how to recognise that moment when it comes, and accept it. And more than that, one must know one’s limits. And you have well and truly reached yours. Fingers on lips, while Aunty Anne explains. Sssshhhhhh……. Now, I love you very much, and I agree it was like totally a complete riot in the beginning, to proclaim one’s self a revolutionary. Haha! What a jolly jape. 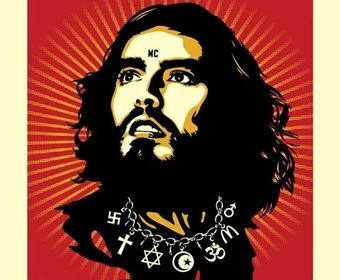 Even the pictures of you, transformed into a modern day embodiment of Che Guevara/Jesus, were like totes hilarious. LOL. This entry was posted in Blog, Cataluna, PANKs, Professional aunt no kids, Reasons I don't have kids, Secret Diary, Spain and tagged BBC, Politics, Question Time, Russell Brand, secret diary. Bookmark the permalink.